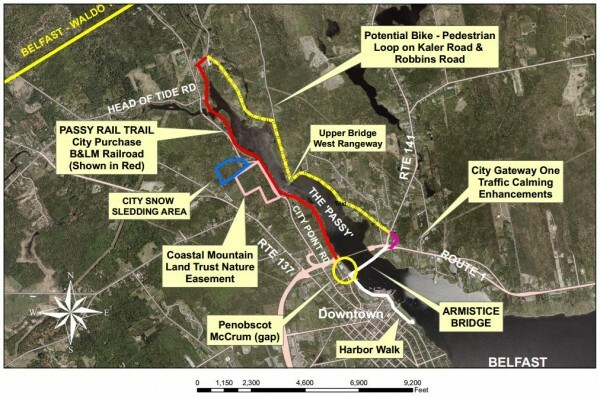 BELFAST, Maine — City officials are excited to be finally gaining ground on a long-planned rail trail that will start at the downtown waterfront and extend for about two miles along the Passagassawakeag River. In May, the federal Surface Transportation Board approved Belfast’s request to “rail bank” the two miles of tracks the city wants to turn into a four-season trail. That means the government will allow for the railroad to be discontinued for an indefinite amount of time, while retaining an easement to lay tracks there again one day if desired, City Manager Joe Slocum said. The government also approved the intended new use of the railroad bed. That’s great news, he said. He said that fundraising efforts so far have been met with a “very positive” response. Belfast is working with the Coastal Mountains Land Trust to raise about $600,000 to build the trail, and while Slocum said he’s not releasing specific figures, he’s optimistic. The project has been dreamed of by city officials for years, and began to take shape in 2010, when the city purchased a three-mile rail corridor from the Unity Foundation for $200,000. Since then, officials have worked with the Brooks Preservation Society, the nonprofit organization that has been running excursion train rides along part of the old Belfast & Moosehead Lake line. The standard-gauge railroad operated from 1871 to 2007, carrying both passengers and freight along a 33-mile stretch of track from Belfast to Burnham Junction. The city entered into a partnership last fall with the Brooks Preservation Society, which had purchased the railroad museum at City Point. Belfast purchased the rights to develop a parking lot, build bathrooms and secure access to the trail’s terminus for an initial outlay of $35,000 and additional payments of $5,000 a year for the next 15 years. The fundraised money will pay for that and also will pay for the creation of a 10-foot-wide trail along the railroad bed. The trail will have a surface made of stone dust, similar to the carriage trails at Acadia National Park, Slocum said. It will not be lit and will not feature utilities like garbage cans or picnic tables, but instead should remain a natural, wooded area, suitable for walking, running, biking and cross-country skiing. Now that the city has federal permission to pull up tracks, it intends to do so as quickly as possible, Slocum said, adding that he believes the value of the steel tracks may pay for the cost to pull up the tracks and ties. In the future, Slocum said that it’s likely the rail trail will connect to the new Harbor Walk. Right now, that’s not possible, as the owner of Penobscot McCrum potato processing factory on the Belfast waterfront is not interested in having the trail cross the property.